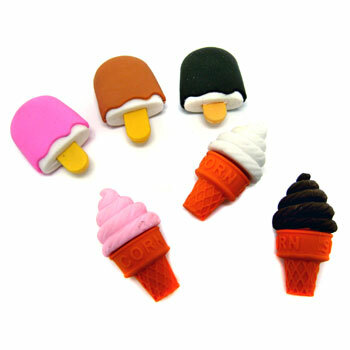 Ice cream cone shaped erasers. 1 1/2 inches by 1 inch. Assorted colors and designs. 48 pieces per tub. Sold by the tub. $6.95 per tub (48 pieces). $4.55 per tub for 36 tubs or more. $3.90 per tub for 72 tubs or more.